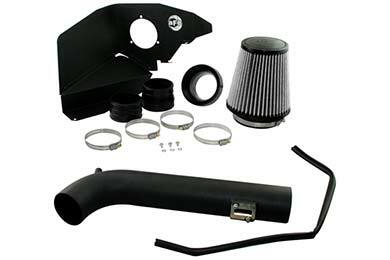 aFe 51-11692 - aFe Magnum Force Cold Air Intake - FREE SHIPPING! I am waiting for my tank of gas to be all out before any mpg calculations are done. I can tell a difference already though. Usually at the 3/4 mark the odometer reads 70 miles, right now it is sitting at 105. The install was very easy, and everything fits. However the one plug, closest to filter, is really close to not fitting. It pulls on the cable. HP gain is very nice, the sound is awesome. Just youtube for the sound, there is one. Got an AFE cold air intake for my 05 crown vic. Easy install, took me about 15, 20 mins. The mass air flow sensor location was a little off, but other than that everything installed just fine. Love the extra sound and power. Definitely recomend it! Super fast service; ordered on monday and installed it on friday. I can't believe the difference in power. I also ordered the Taylor Cable throttle body spacer, and installed them both in under 45 minutes. My only complaint is that I will soon have to replace my rear tires. Reference # 752-615-763 © 2000-2019 AutoAnything, Inc.